We had a great #WAPPS (Women and Apps) session with bSafe today. The first version of bSafe was launched in 2011 in Norway - a small country with 5 million people in northern Europe- by Silje Vallestad and with a wave of sexual assault cases hitting the capital of Norway, bSafe became the natural companion for many women. When she started the company she had no background from technology or business, but had been starting and running international idealistic projects and organizations since the age of 14. In her early 20s she had already been working and debating with people like The Dalai Lama, Hillary Clinton, President Vaclav Havel and Dame Anita Roddick., as well as running soup kitchens, working with young grassroot idealists and youth around the world. Silje is an entrepreneur at heart, and when she gets an idea there is no stopping her from bringing it to life. Going from dream to reality is what gets her up every morning, and when she had a dream about technology services she wanted but couldn’t find, she through herself out on deep water and learnt how to swim. After succeeding in Norway, Silje felt it was time to introduce bSafe to the world. She got on a plane with her husband and three kids and relocated to Palo Alto- the heart of Silicon Valley. The App was recently launched in India when the developers realized the need of it in the country after the Nirbhaya case. Users reported that bSafe has functioned as an effective deterrent, scaring away attackers and allowing emergency personnel to arrive promptly. BSafe Many use the app while working or exercising alone. One user reported bSafe saving his life when he had an extremely severe hiking accident! Without the app to alert his Guardians of his exact location, he is sure he would have died on his own. 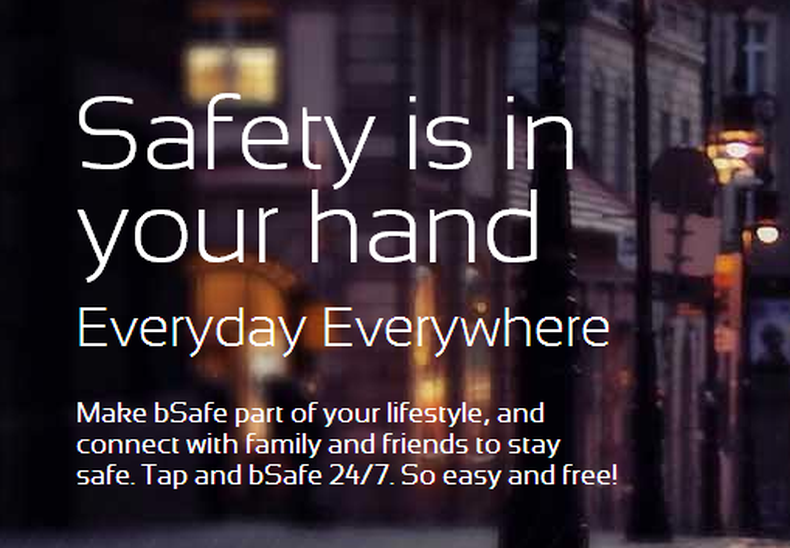 bSafe is your perfect lifestyle app to stay in touch with your friends and family members and enhance your safety everyday. Works everyday everywhere in all countries. Simply install bSafe on your iPhone or Android phone to get started, and set up your safety net. Perfect for everyday safety, and the ultimate safety tool if you ever find yourself in a n emergency situation. bSafe is always there for you! Hide if you don´t like to share your location. In case of an emergency or when you use Follow me and I´m Here, your location will of course be shared for your safety. With bSafe maps you both have all safety features at your fingertip, and your map for safe navigation. We´ve even included a flashlight for you to use any time it´s dark! The more Guardians you choose, the safer you are. Add all your friends and family as your Guardians for a bigger and better safety net. Choose one person as your primary Guardian. In case of an emergency this one contact will not only receive a text, but also be called. Help is only one tap away with bSafe. 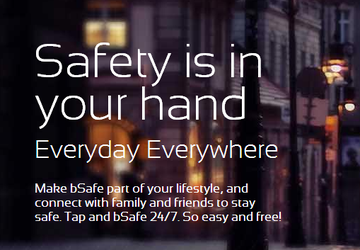 When bSafe You is open on your screen, it forces the screen to stay open for safety right at your fingertip! If alarm is triggered you set off a siren (optional), and bSafe starts recording video and voice as well as broadcasting your location…all at once! Video, voice, location and time stamps are all stored securely in our servers. you always have access if you need to share this data with the police. Invite Guardians to walk with you via live GPS trace with bSafe. Now you never have to walk alone again! When Guardians accept your invitation and join your journey, bSafe notifies you immediately. This way you always know who is watching over you. If you have not checked in on time, the bSafe alarm will automatically trigger and alert all your Guardians. Don´t worry, you can always update your timer as you move.